Hanoi (VNA) – Vietnam and Myanmar issued a joint statement on their comprehensive cooperative partnership on the occasion of Party General Secretary Nguyen Phu Trong’s State visit to Myanmar from August 24 to 26. The statement reads that at bilateral talks and meetings, Vietnamese and Myanmar leaders shared the view that the State visit by General Secretary Trong is a historic milestone in the two countries’ relations. They expressed their delight at the rapid growth of the traditional friendship and multifaceted cooperation in recent years, agreeing to promote bilateral cooperation between the countries’ parties, parliaments, governments and people. On the basis of the growing bilateral ties and new developments in the region and the world, the leaders agreed to establish a comprehensive cooperative partnership between Vietnam and Myanmar. This partnership will intensify the countries’ five cooperation pillars, namely political relations; defence and security cooperation; economic cooperation; cultural and social cooperation, people-to-people exchange, and other fields of shared concern; and cooperation in the region and the world. With the newly founded comprehensive cooperative partnership, the two sides agreed to enhance political ties through mutual visits and meetings at all levels. They agreed to bolster government-to-government cooperation and make efforts to improve bilateral cooperation in economy, culture and science-technique. To strengthen the two economies’ connectivity, they pledged to prioritise cooperation in transport infrastructure and tourism while expanding connections in agriculture-forestry, telecommunications and banking. The two sides were also unanimous in taking measures to improve the investment climate so as to encourage Vietnamese and Myanmar businesses to invest in each other’s markets. They agreed to step up investment and trade promotion and trade facilitation, thus raising bilateral trade to 1 billion USD as soon as possible. 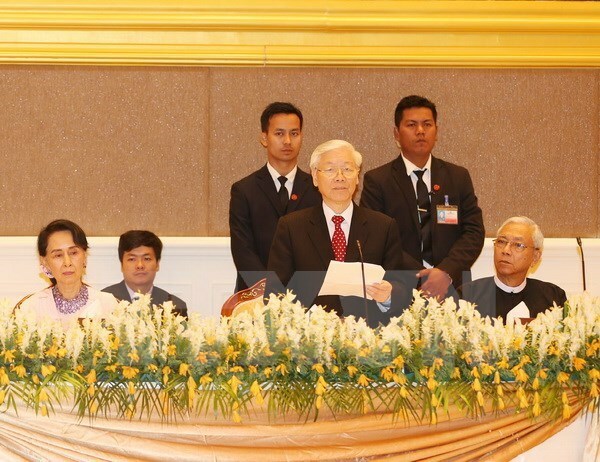 Party General Secretary Trong affirmed that he will encourage Vietnamese firms to invest in potential areas in Myanmar such as energy, telecommunications and infrastructure. President Htin Kyaw recognised the contribution by Vietnam’s investment projects in Myanmar to local socio-economic development, reiterating that he will create optimal conditions for and ensure interests of Vietnamese businesses in his country. The two sides also concurred in fostering cooperation in information and communications technology and telecommunications. The two leaders shared viewpoints on regional peace and security issues of mutual concern and vowed to boost bilateral security and defence cooperation through the sharing of information and experience, bringing into play existing cooperation mechanisms, and considering the establishment of defence policy dialogues and a joint working group between the two defence ministries. They also applauded their countries’ effective implementation of the bilateral security dialogue mechanism, agreeing to reinforce cooperation in security, including working together to build and complete legal frameworks for joint activities in crime fight and justice. They noted with satisfaction the two countries’ good coordination and cooperation at regional and international forums like ASEAN, the United Nations and the Non-Aligned Movement. General Secretary Trong appreciated Myanmar’s readiness to support Vietnam’s candidacy for non-permanent membership of the UN Security Council for 2020-2021. Both sides welcomed the continuation of cooperation in the management and sustainable and effective use of the Mekong River’s water resource, which they said are important to Mekong countries, including Vietnam and Myanmar, as well as to the connectivity, community building, stability and development of ASEAN. They repeated the commitment to maintaining and promoting peace, security and stability in the region, resolving disputes by peaceful means, not using force or threatening to use force, and complying with broadly recognized principles of international law, including the 1982 UN Convention on the Law of the Sea.